These sample prayers come from a variety of authors. They are Christian prayers that focus on seasons of difficulty in life. like a chrysalis on a lonely limb. not coming, not going, just hanging on. and struggle against required surrender. for my time to fly has not yet come. This prayer is based on the story of the Canaanite woman from Matthew 15:21-28 and Mark 7:24-30. I think it is a helpful prayer for times of grief and difficulty because it acknowledges that sometime we just feel angry at what seems to be God’s response to our situation. would you hand me a stone? Oh, God, where is the bread? I’ve sat with open hands for hours. Is my heart as open as my hands? Is my closed heart laughing at my open hands? And I wonder, where is this gift of finest wheat? Have I become the Canaanite woman to you, Lord? Well then, I’ll put on her mind instead of yours. I’ll wear her faith instead of your arrogance. Even the dogs get the crumbs, Lord. God, you cannot hide from me. You cannot scare me with your face of absence. I scare myself with this hunger for your presence. I will break all rules to possess you. I would go to every table in the world. it be changed to bread. I’ll gather up the crumbs if you insist. and rejoice that I have been so blessed. so dependent on your bits of grace. Here is another Joyce Rupp prayer that is specific for grief and loss. that are stored within me. of my loved one’s life. lift up my sad heart. in the midst of my loss. in the midst of my sadness. in the midst of my emptiness. in the midst of my confusion. as my shelter and my solace. When my book first came out, the director of the school I was attending always referred to the book as Janelle's prayers. It always surprised me a bit. And yet, when I stop and think about it, I realize she is right. If we look at the Psalms of Lament, we realize that prayer don't always take the standard religious forms. And sometimes the cries of our heart are the most meaningful. After a reviewer watched the video bonus feature offered with the audio book, she told me how calming and transformational it was for her. Isn't that what prayer is all about? Transforming us and taking us to the center of all that is unchangeable. Click the link below to see more information about the audio book. 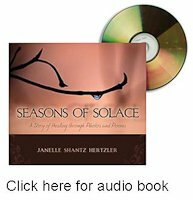 The Grief Journey uses the Psalms of Lament as sample prayers for people during seasons of grief and pain.